Chris, a fellow math teacher and all around terrific blogger, send me a nice return package yesterday. 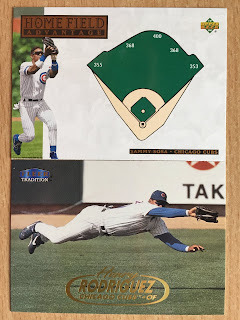 Back in August I sent him a "back to school" mailer of Barry Larkin cards and was surprised when eight of the nine that I sent were new to his collection. Nachos Grande hit me back and it came at the perfect time, because I need a distraction. Yesterday morning we were mowing the grass infield at our high school diamond before our Saturday doubleheader and now we have four inches of snow on the ground! There's no sign of it letting up until later this evening. Yuck. I'd like to say this is just an anomaly, but last April it snowed on three different occasions. If my memory is correct, P-town has had to deal with the white stuff falling from the skies in each of the last seven calendar months. Sheesh. 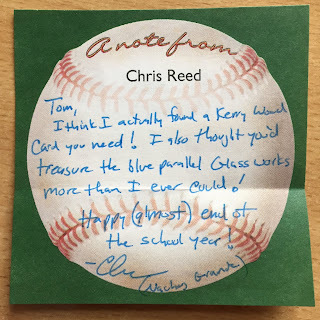 So, here's the package from Chris to help take our minds off of the weather. 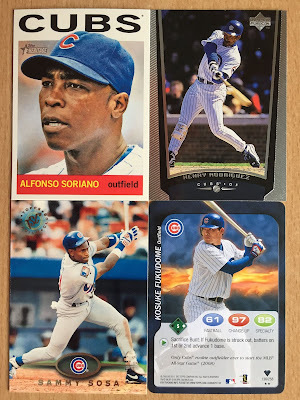 I once purchased a Paul Goldschmidt Glass Works card, but then I promptly shipped it out as part of a trade package. I bought the card for the sole purpose of sending it out, but it was difficult to let go of because it was so stunning. Now, I have one of my own! These cards are just gorgeous. I love the clarity and all the blue! 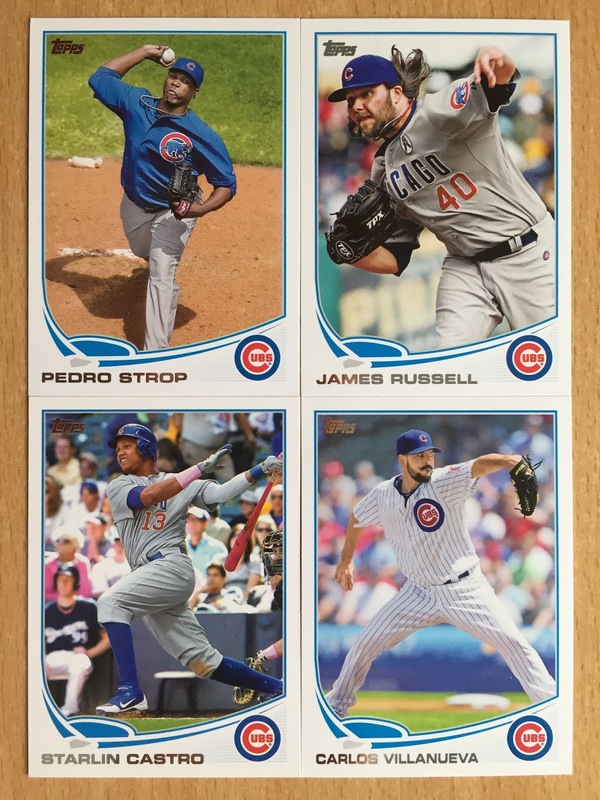 Believe it or not, I needed that 2013 Update card of James Russell for my Cubs collection. Here's a quartet of slugging out fielders: Soriano, O-Henry, Slammin' Sammy and Fukudome. More Sosa and Henry Rodriguez. O'Henry wasn't known for his defense, but that's a pretty excellent effort Fleer captured there. Sammy got a lot of love in this package! The Ticket to Stardom concept was something unique. 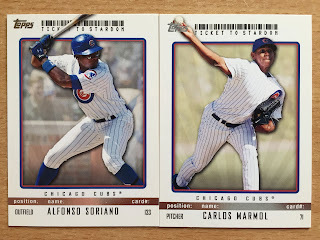 I enjoyed the die-cut perforation parallels in this set as well. Amazing Grace and Kid K! 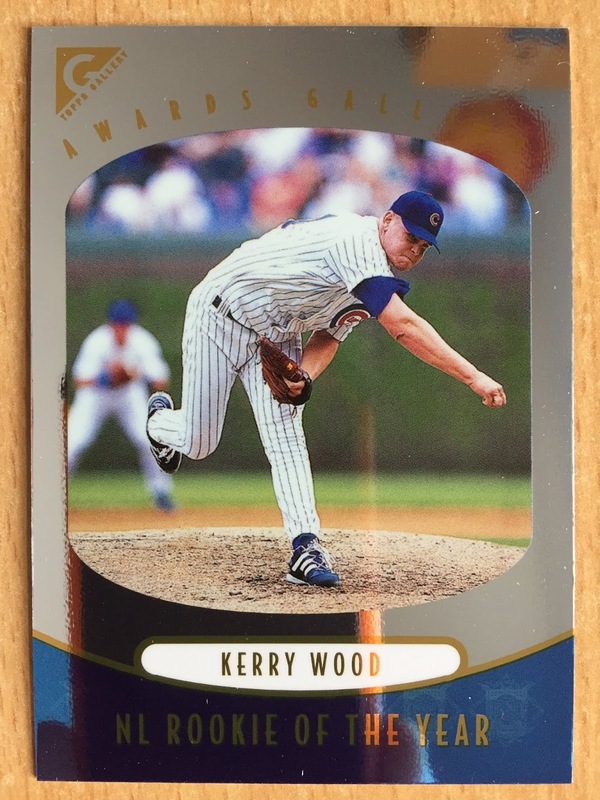 I had the above Kerry Wood in my player collection so it will go into the Cubs boxes. 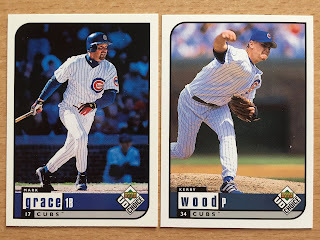 The one below was gives me 545 Kerry Wood cards overall. So shiny! Chris, thanks for the most excellent package! As always, I'll keep an eye out in the future for any Barry Larkin cards that may cross my path. That Rizzo Glass Works is fantastic! I bought a Corey Seager on COMC just to have one. It's got a tiny crease and printing imprint on the back, but the front is a work of art. Snow on Sunday, 70's by Tuesday. Gotta love spring in Central Illinois! Not a fan of 97% of the modern day insert sets. Glass Works are a member of the Elite 3%. I have the same blue Anthony Rizzo glassworks box topper and I absolutely cherish it. 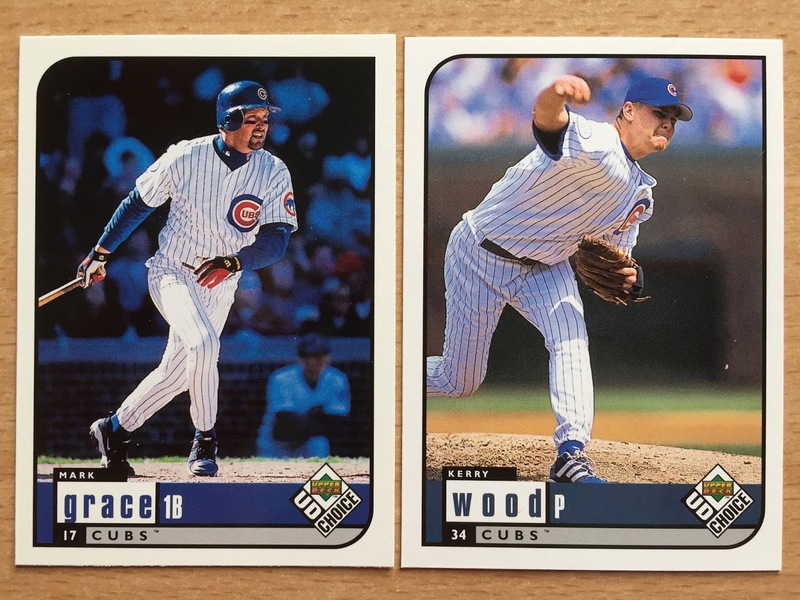 It's a shame that Topps didn't bring those beautiful cards back in 2019.